Barcelona is the destination of the moment. It is a city which has it all – great vibes, great views, great weather, interesting architecture, bustling city life and also a beach. There are high street shops, designer shops and quaint markets, shops large and small and of course an abundance of tapas and sangria. If you are looking for somewhere to stay that is close enough to the centre without being stuck in amidst the chaos, Hilton Diagonal Mar Barcelona is your ideal choice. It offers great value for money in a city hotel, with large, freshly decorated rooms, contemporary décor throughout, and PuroBeach Barcelona – a beach club concept and real highlight of the venue. 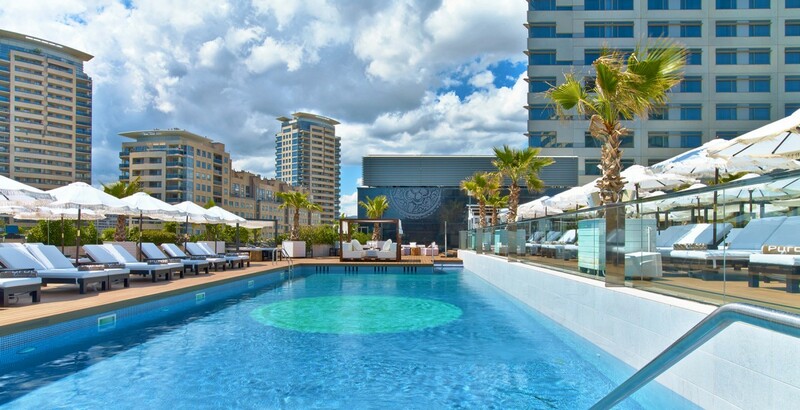 The Hotel is about a 25 minute transfer from the airport and although you can’t access your room until 3pm, once checked in you are welcome to make use of the leisure facilities such as the gym, Purobeach Barcelona and the bar. We stayed in one of their newly refurbished club rooms – contemporary and stylish, they marry together sophistication with chilled city vibes. The bed is large and comfortable, with smooth white linen and supremely plush pillows. A chez long sits near the window for reclining and looking out at the views and there is also a modern-looking desk, unit and television. The bathroom, again, is of good size for a city hotel with a nice sized bath, shower and sink. Considering the Hilton can be known as a reliable business Hotel, the Barcelona Hilton Diagonal Mar Barcelona manages to retain its functionality whilst also offering the chance to let your hair loose – it’s not stuffy and pretentious and filled with suits, it offers a perfect mix of the two. It’s cool, it’s chic and it’s rather sassy. Purobeach Barcelona is a beach club concept – a supremely chic and sophisticated venue which oozes relaxed beach vibes and offers a destination to let all your stress ebb away. It is achingly trendy, with sleek white furniture and a smooth wooden floor leading to the main pool, being both elegant yet relaxed, with chilled house music pumping in the background and the gentle waft of fresh fruit cocktails in the air. The pool itself is surrounded by plush white loungers and a few super luxurious cabanas finished with floating white linen covers to shield you from the sun. The pool water is crystal clear and the area drenched in warm Mediterranean sunlight. Waiters and waitresses are constantly attentive, bringing fresh fruit platters and delicious smoothies straight to your lounger. We indulged in a couple of their frozen cocktails which were not only the best frozen daiquiri’s I had ever tasted, but a welcome respite from the heat. As soon as you enter Purobeach you leave behind the dusty grind of city life and are transported to the throes of utter tranquillity. Check out what’s on when you go as they often have live DJs too. Dinner at the Hilton Diagonal Mar is also an experience unto itself. The relaxed vibes continue through into the evening and as we took our seats at the terrace on Purobeach Barcelona, we were well under the Hotel’s spell. Dinner takes place either in the main hotel restaurant, or up on the same terrace at the pool. Being in Spain, we (of course) opted for a tapas menu and sipped on their house red wine overlooking the bustling city below. The food was cooked to perfection – quesadillas, paella, fresh fish… each dish was teeming with flavours and piping hot. There is also an a la carte menu available for those who fancy something a little different. Following this we continued to the Purobeach Barcelona bar area where we ordered a couple more cocktails and relaxed on the plush sofas. Rugs and blankets are available for if the evening’s turn a little chilly and the music continues to play. The atmosphere, quality of drinks and great music choices negate the need to leave the hotel, you could happily while away the hours without a care in the world. Breakfast at Hilton Diagonal Mar Barcelona takes place in their main restaurant. It’s a large and sumptuous buffet, with everything from pancakes and waffles to a full English. There are a variety of juices, cakes, pastries, fresh fruit and more to enjoy and fill up on.